Menteri Kominfo Rudiantara mengunjungi dua kabupaten terdalam di tengah Papua yaitu Kabupaten Puncak Jaya dan Kabupaten Membramo Raya untuk melihat secara langsung layanan telekomunikasi USO dan memastikan rencana Palapa Ring Timur. INDUSTRY.co.id - Jayapura - To ensure equity of telecommunication development is realized gradually. Through the provision of telecommunication access to USO and the internet, the Information Technology Accessibility Agency (BAKTI) of the Ministry of Communications and Information Technology built Base Tranceiver Station (BTS) in the foremost, outlying and backward areas (3T) and internet access for schools and Puskesmas. Wednesday (18/07/2018) yesterday, Minister of Kominfo Rudiantara visited two deepest districts in the middle of Papua namely Puncak Jaya District and Kabupaten Membramo Raya to see firsthand USO telecommunication services and ensure the East Palapa Ring plan runs well. "In accordance with the Government agenda of Pak Jokowi and Vice President Jusuf Kalla, Kominfo and BAKTI provide access for all Indonesian people, build with Indonesia Sentris starting from the outskirts to be equivalent to Java, Sumatra and Kalimantan," said Minister of Communications and Informatics Rudiantara in Working Visit to see the development East Palapa Ring and 3T BTS in SMKN 1 Mulia Kab. Puncak Jaya, Papua. Indonesia Sentris according to Minister Rudiantara is the way that the government in accordance with Nawa Cita President Joko Widodo and Vice President Jusuf Kalla. "The edge is not marginalized, but it is part of the Unitary Republic of Indonesia that must be fully guarded, Puncak Jaya is middle (because it is in the middle of Papua) and we are always working for our younger siblings and a better future," he explained. Even the Minister of Communications and Informatics targets all districts and cities in Indonesia will be connected with a fast internet backbone network in the Year 2019. "This policy of government alignments to ensure all people can access the internet fast," he said. Telecommunication access in view of the Minister of Communications and Informatics is the right of Indonesian citizens. "Next month Indonesia has been independent 73 years, we are free from the invaders but not yet free from the internet," he said. Tanah Papua, according to the Minister of Communications and Informatics is a great blessing for the Indonesian nation. "The land of Papua gives us a blessing, on the way here it was told that the Provincial Secretary was in the mountains the greatest gold there was a lot of people just take it, just to receive it I have to fly," he said admiring the beauty and potential of Papua. Minister Rudiantara acknowledged the challenge of developing infrastructure in the Papua region. "Similarly, in terms of building telecommunications, Papua is not like Java whose geographical conditions are easier to build," he said. Regarding the construction of telecommunication access, Minister of Communications and Informatics likes such as access to transportation. "Like Puncak Jaya which cannot be reached by road, it must be air, in telecommunication if it cannot use the cable using satellite," he explained. Regarding network access capacity, Minister Rudiantara also likened to airplanes. "The same capacity as the airplane will depend on the type of aircraft, analogy is similar to telecommunication," he explained. In realizing connectivity in accordance with the priorities of the Government, the Minister of Communications and Informatics demonstrates his determination. "We will not give up. All districts in Papua and Papua have 41 districts to be built rapid internet backbone network There are 31 (new districts) for new access to high speed internet access. It is the pride of the government of Indonesia Sentris, "he explained. In particular the Minister of Communications and Informatics requested the assistance of the Bupati and all its staffs to ensure internet access can be realized. "We hope there will be no villages without BTS In 2019 in Puncak Jaya village that has not been installed, hopefully can be installed (internet) We ask for help from the Regent because the problem in Papua is about the land. Number one about licensing, second ground if there is no soil antenna where? “he pleaded. Regarding internet access already used for school needs, Minister of Communications and Informatics ensures this year there will be mining of internet access point. "Until the end of this year there will be an increase in capacity," said Bupati, asking for two additional points, we will love four points. Earlier, Puncak Jaya Regent Yuni Wonda appreciated a new breakthrough by the central government to build telecommunications in the foremost, remote and backward areas. "Jokowi-JK Government's new breakthrough to build telecommunication in 3T area is very beneficial, thanks to the internet access of people in schools, health centers, and public locations," he said. 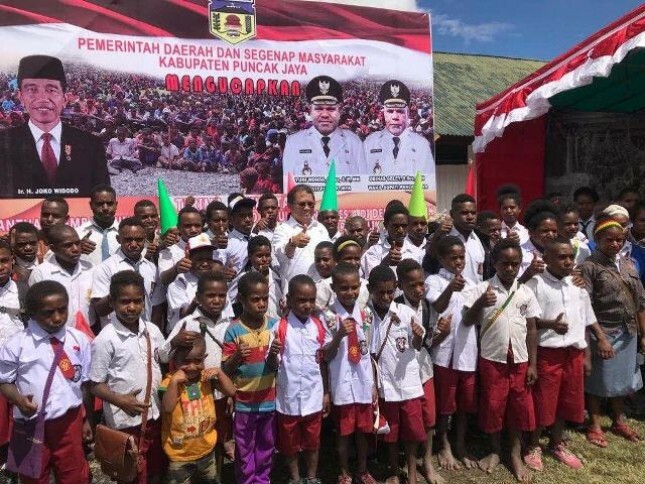 Even the Bupati of Juniwonda requested that next year the entire school can get internet access for the national exam requirements and the admission of new learners. "We hope that next year all Puncak Jaya can access internet so that (can) the implementation of PPDB system and with the internet access can erase the access gap in the countryside," he said.